Durable 24k Gold plated, all metal phono plugs. Double shielded with braid and foil. High grade RG-59 coax, OFC cable. Ideal for digital audio or video. A high quality interconnect cable for digital audio or video with a single phono connector each end. The lead is manufactured from oxygen free copper (OFC) RG59 coaxial cable and is double screened for the ultimate EMC and RFI performance. Featuring all metal, 24k gold plated with spring reliefs for the ultimate in signal transfer and durability. 2m Angled 3.5mm Stereo Jack to Jack Audio Cable. 90 degree right angle connector both ends 3.5mm stereo jack plug to stereo jack plug. Gold plated connectors. Colour black Length 2 metres Ideal for connecting audio devices to aux in connections Suitable for use with phones, tablets, laptops, PCs, ipods, portable audio devices and any other device with a 3.5mm audio output. 15m Scart Lead, round scart cable with metal plugs and gold plated contacts. 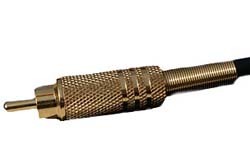 High quality round cable Scart Lead with metal bodied connectors and gold plated contacts. All 21 pins connected with individually screened OFC cable to provide the ultimate picture and sound quality. Pearl chrome metal body connectors. Ideal for interconnection of VCRs, satellite receivers, digi boxes & DVD players to televisions etc. 2m Component to DVI cable. This cable allows a component video signal to be connected to a compatible DVI-I input. A high quality Component Video to DVI-I cable, featuring 3 colour coded phono connectors one end and a DVI-I plug the other. 75 Ohm Coaxial Cable, connectors feature gold plated contacts. 1m White 3.5mm Stereo Jack to Jack Cable. 1m stereo 3.5mm jack to jack cable, ideal for connecting audio devices. 3.5mm stereo jack plug to stereo jack plug. Gold plated connectors. Ideal for connectin an ipod or MP3 player to a hi-fi or car audio system.